Let’s Have Fun With Underlines! We all like to save time. And most of us are in a hurry too much of the time. So, here’s a question for you: Have you ever noticed the underlined items in some Windows menus? You did? Well, you are in the minority. Most of us don’t notice them, or if we do, we don’t pay any attention to the. But today, you’re all going to notice them and learn what you can do with them, as we are going to have… FUN WITH UNDERLINES! <—- Over to the left there (I hope), you can see what is known as the Win Key + X menu. It’s the menu you see on Windows 10 when your press the Windows Key + the X key. If you look closely you’ll see every item on that menu has one underlined letter [except Control Panel, which I put there not Microsoft]. So, what you do think will happen if you press the letter on your keyboard that corresponds to the underlined letter in that menu. Yes, EB? RIGHT! It opens the item. For example you can see I’ve circled the underlined letter “O” in Power Options. Now if I have this menu open and I press the letter O on my keyboard, voila! Power Options opens. Now, EB smartypants… what happens if I have this menu open and tap the letter “A” on my keyboard. RIGHT AGAIN, EB. A command prompt with administrator privileges (elevated command prompt) opens. Now, if you have an eagle eye, you’ve noticed that one item on this menu has no underlined letter – and that is Control Panel. And do you know why? Because I am using Windows 10 Version 1703 (Creators Update) and Control Panel is not on this menu by default – I had to add it. Wanna know how? Here you go. A lot of menus have items with underlined letters in them. 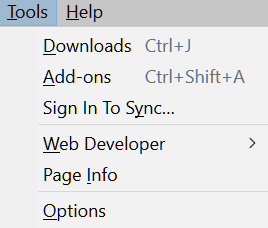 <—Look at the Firefox “Tools” menu over there (the gray dingy looking thing). So, EB, what happens if I open that menu in Firefox and tap the “D” key on my keyboard? RIGHT AGAIN, EB! The Downloads folder opens. 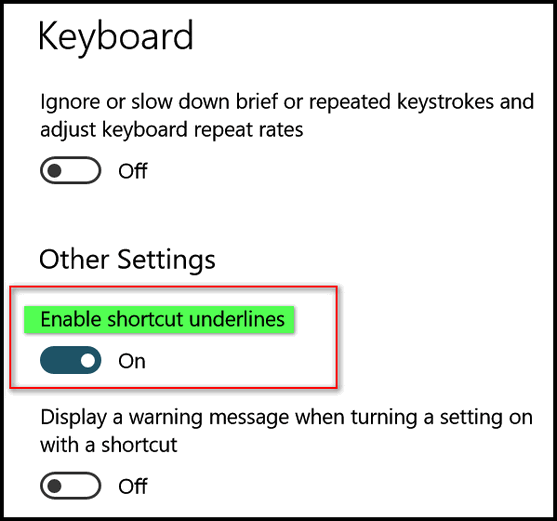 Now everyone knows what these underlines mean and that they can save time by jumping to a menu item by tapping the letter underlined in the menu on the keyboard. That’s what I call fun with underlines! None of this works on my computer. The Windows Key plus any of the letters Underlined results in absolutely nothing. Nowhere in the article does it say anything about pressing the Windows key. Underline shortcuts on menus work only when the menu is open and you click the underlined letter. These are not Windows key shortcuts. That is fun with underlines – never knew that before – thank you!! !